TJ's has offered us a number of unusual, but surprisingly good soups over the years. I'm thinking Lentil Soup with Ancient Grains and Tomato and Red Pepper Soup. But, they've also offered a number of so-so selections like the Rice Noodle Soup Bowls. In several past posts, I've mentioned that I love seaweed. And at least once I've mentioned that I hate kimchi and sauerkraut—the whole rotted cabbage deal just isn't my thing. Well, this dish has both seaweed and kimchi, but as the product's name would suggest, seaweed is more prominent in the soup. There's little more than a few kimchi flakes in the whole package. Thank goodness. But I do have to admit that they added a hint of excitement to an otherwise unremarkable broth. The noodles are really good. They're thick and soft—but not too soft, depending on how long you cook them—and they've got about as much flavor as you can expect a ramen noodle to have. There seemed to be an excess of broth when we added the prescribed amount of water. Two cups I think. And less water would have meant a slightly stronger flavor in the broth, which I wouldn't have minded one bit. It was sorta spicy as it was, but I could have stood it being doubly so. I also wouldn't have minded more seaweed. I liked the way the noodles and seaweed paired up, but I still had half my noodles left when the little green leaves started getting scarce. 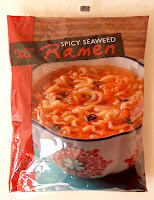 This product is a really easy, inexpensive international snack, but it's also unsubstantial and would benefit from a stronger broth and more seaweed. All in all, not a bad value, but probably not something we'll buy on a regular basis. I give it 3.5 stars. Sonia gives it an even 3. Here's a photo of the prepared product, with some of the broth drained out. We didn't waste the excess liquid. We used it in a culinary experiment so shameful, that I shan't mention it on this blog for fear you'll downgrade me from a "foodie-hack" to a "person who shouldn't be allowed to eat at all." Okay, you twisted my arm. I'll tell you. We added chicken hot dogs to make an Asian-American fusion dish. Please, kids, don't try it at home. The picture kinda scares me.. As far as kimchi if u are talking about the cabbage kind, I agree. My relatives use to make that version... I love the cucumber one better. They used the little pickling ones u see at the market.. Reminded me of an Asian (kosher) pickle... great crunch and a little spice. Totally, KBF, cucumber kimchi is way better than the cabbage stuff! I did not like this at all! YUCK! Would only get 1 star (maybe!!) from me!! Not vegetarian-- it contains bonito. The tag raised my poor little vegetarian hopes, only to crush them. Just tried some. The 52% dv of sodium scared the holy hell out of me, so I cut the sauce in half and stayed with the 2 cups of water. It wasn't a potent broth but it was still spicy and good as far as Ramen goes. That was pretty awful - super bland! Apologies, Kate. Totally didn't notice the anchovies and shrimp on the ingredients there! We'll try to catch that in the future!